A step sequencer for sequencing midi data into midi clips. Track controls allows control over each tracks volume, panning, monitoring, sends, mute, solo and arm status. The default state deals with track reset buttons, arm, mute and solo. The sub programs allow control over the volume, panning and sends. Per track control of high/low pass filter. Has both smoothed and queued (press buttons consequetively to queue) transitions and per track adjustable q. Press and hold one button in the right hand column to change the filter type or adjust the q value. Kind of like mlr, allows you to move the position of a loop within a currently playing clip. Press a button to jump to that position in the clip, the clip will loop that specific region until you either jump to another position or press the same button again to release the loop. Press and hold a button in the right hand column to configure the length of the selected loop. A set of 7 banks of 7 midi faders. Each fader is configurable to send instant or smoothed changes with a selection of transition speed. Each fader is also configurable with 3 different display types. Configuration information is saved in a set of audio racks positioned in the master channel. Press a bank button a second time to get to the configuration menu. A scaled midi keyboard, with root and key selection and a hold function for instruments with a long attack. 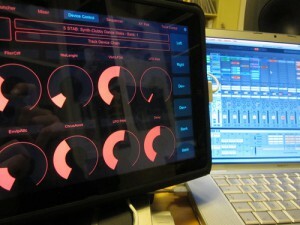 A program to interact with Lives Drum rack program. Program keywords can be specified with two added suffixes. W: Works with all programs and removes the final row from the display in most cases the control row. Scale: Removes the bottom two rows that change key and octave. These can be configured using the config file. TrackControl: Removes the arm and solo buttons. External Application can be used to load other programs into LiveControl. The app can be configured using the configuration file. Hello, loving the software. Thanks very much for all the hard work! I am having difficulty getting the /ext1 external function to work. In my livecontrol.txt file, I have external listed, and i should replace “/ext1” with “/7up” for example, correct? If 7up is running in max for live, then livecontrol should send on 4001 and listen on 4000, and 7up should do the reverse, correct? is the external program working on the newest release? erm it was flakey before, not tested it recently, its still going to be limited to a latency of ~60ms so you might be better off using monorouter or something along those lines. Octinct (arduinome RGB clone) wiki already!